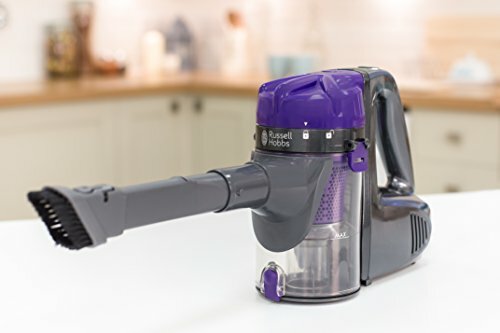 The Russell Hobbs Lite 3 in 1 might not manage to tick enough boxes to lure in everyone curious about cordless hoovers, but the extremely cheap – relatively speaking – pricetag means that you’ll be able to find out whether or not it’s good enough for your own requirements without need to break the bank. We recently spent some time trying it out and wanted to share our experiences. The hoover arrives in some fairly standard packaging – pretty much what you’d expect for a product in this price range. In terms of weight, you’re looking at around 2.8kg, so it’s noticeably lighter than something like a Dyson Light Ball or a Henry. One of the nice inclusions from Russell Hobbs is the 2 in 1 crevice and brush tool, which has been designed to make hard to reach places much easier. 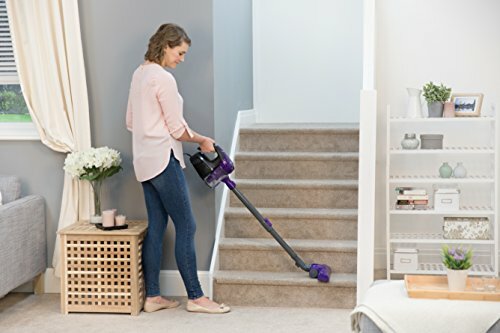 There’s also a floor head attachment and telescopic tubes, making the hoover ideal for hoovering carpets as well as the harder-to-reach spots. The Turbo Lite uses the smaller form factor found in Dyson cordless vacuums, without actually being cordless. This means that it’s somewhat easier to perform awkward hoovering tasks – especially when you consider how much lighter it is than conventional vacuum designs – but you’re always going to be tethered to a nearby power source while doing so. The power cord is seven metres long, which we found to be adequate for our requirements. During actual use, one issue we ran into before long was the fact the dust reservoir fills up much quicker than we would have liked. As a result, you can expect the filter to more or less get clogged up after the briefest periods of use. Not only that, but emptying the bin is unnecessarily complicated, and requires pushing a fairly sensitive-looking clip; in fact, we read numerous reports online from angry customers who had suffered the misfortune of the clip snapping without any excessive force. Unlike many other hoovers, which tout lower power consumption without compromising suction, the Turbo Lite 3 in 1 has actually seen a significant increase in its electricity usage – a previous iteration of the model was rated 450 watts, while this one is rated 600 watts. That, alongside the extremely questionable build quality, was definitely enough to put us off considering this hoover for the long-term. On the upside, its performance was passable on both carpets and hardwood floors. Picking up dust and crumbs was easy enough, but embedded pet hairs and other more challenging tasks were clearly too much for this cheap vacuum. If you don’t mind the fact that the results from the hoover are going to be far from perfect, it’s probably not the worst choice you can make. Those of you who need a cheap hoover and aren’t particularly worried about how long it lasts could probably do worse than the Turbo Lite. Its suction is acceptable, and its design is handy for a variety of situations. That said, eventually, this thing is going to fail on you. For all of these reasons, we can really only recommend it for students or anyone else on a budget. Those of you with a bit more cash in your wallet should look elsewhere.